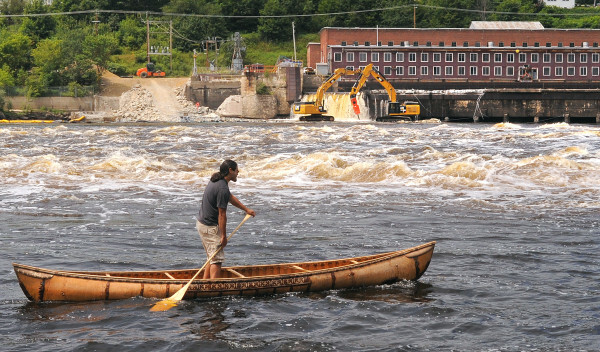 Joe "Hugga" Dana paddles a traditional birch-bark canoe as crews work on the ceremonial breaching of the Veazie Dam on the Penobscot River in this July 22, 2013, file photo. 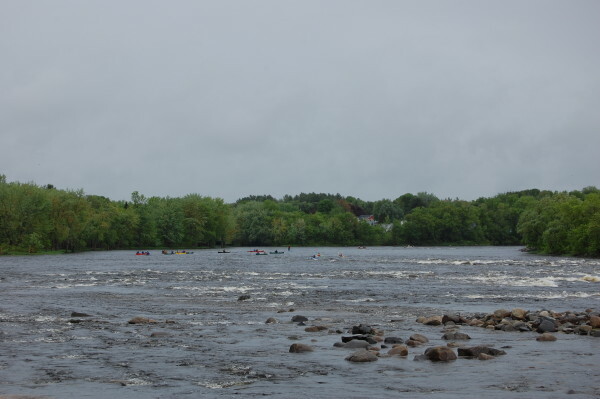 The first Bashabez Run, a 15.5-mile canoe race from Indian Island to Brewer, was the first canoe race to the tide water of the Penobscot River since the removal of the Great Works and Veazie dams in this August 2014 file photo. 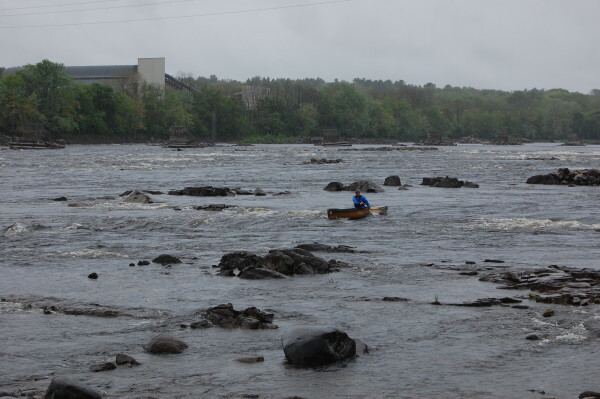 Boaters test the waters during a trial run of the Penobscot River regatta in May. 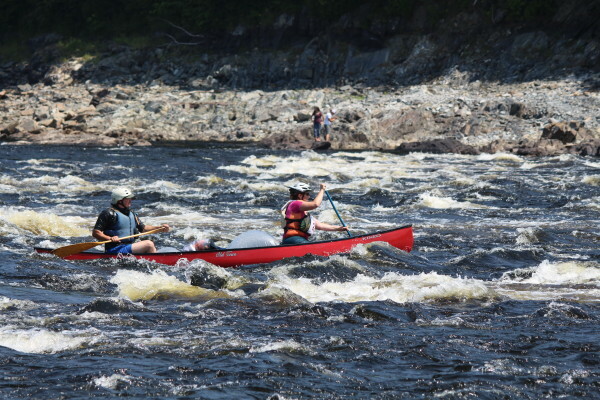 OLD TOWN, Maine — Removal of the Great Works Dam in Bradley and the Veazie Dam, part of the Penobscot River Restoration Project, had an added benefit for those who like whitewater, according to organizers of the upcoming Penobscot River Whitewater Nationals Regatta. The 9.4-mile section of river, where the various race events will be held from July 22 to 26, starts at the waterfront park in Old Town and ends at the Eddington Salmon Club. “We expect over a hundred boats for the downriver races, and there will be races for kayaks, decked canoes, standup-paddle boards and special events for kids,” Phillips said in an email. 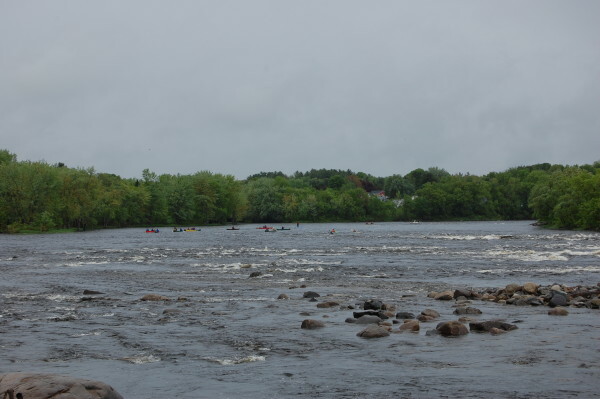 The race course includes three Class II-III rapids, numerous rips and quick water, according to the regatta’s website. The event will include four days of paddling events and will conclude with the American Canoe Association crowning the downriver racing national champions. In addition to the newly exposed whitewater, the region is “also easily accessible. 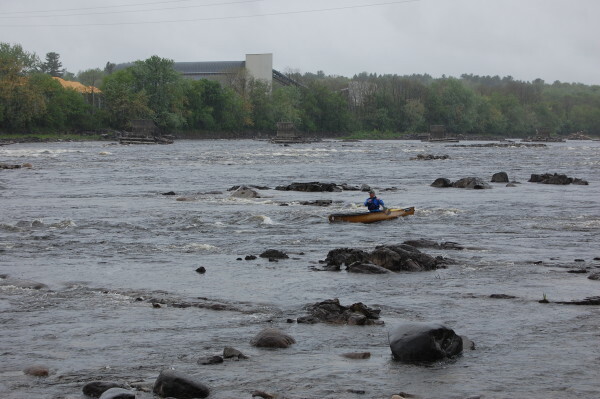 It’s easy for people to get here, and there are places for people to stay,” said Phillips, who has worked on the river restoration project for 13 years and has worked at Old Town Canoe and Kayak for 20 years. “And it’s new,” he said of the whitewater race course. The Whitewater Open Canoe Downriver Competition has been held on the Nantahala River in North Carolina for the last three years. 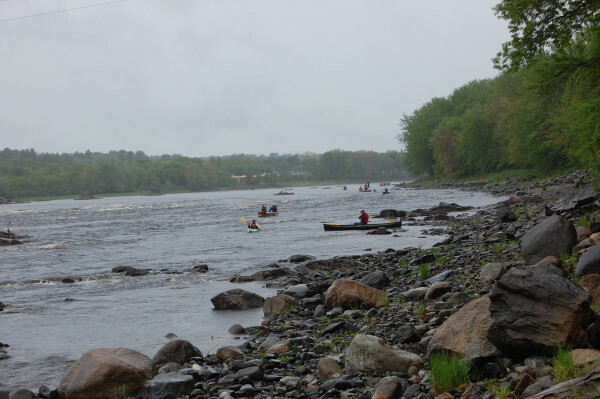 The event was held in Maine on the Kennebec and Dead rivers in 2009 and on the Lower Dead River in 2005. 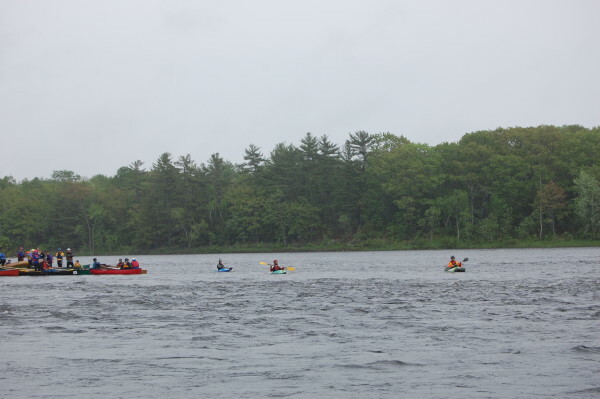 The Penobscot Indian Nation is hosting the event in partnership with the American Canoe Association. Organizers said the regatta will be an opportunity to expose participants to the local native culture. Penobscot Nation Cultural Director James Francis is working on programs. Penobscot Nation artists will be displaying and selling items during the daylong July 25 riverfront gathering at the waterfront park, and the Boomhouse Restaurant will be hosting a public dinner that evening, Phillips said. Those interested in participating in the regatta can register online until 4 p.m. the day before each scheduled event; those who register by July 10 will save $25 per person. “You cannot register on the morning of any event, because each boat needs to be measured and inspected for each race,” Phillips said. Pre-race meetings are held 5:30 p.m. the day before each race and are mandatory, he said. People who want to watch the regatta should have a good view from Front Street in Bradley, the race director said.